Whenever working with MS Outlook one may find difficulty in performing day to day tasks like sending or receiving emails, downloading attachments etc. and sometimes more serious problems like shutting down of Outlook abruptly. All these problems are followed by some error messages which determine the type of error Outlook is facing. The most common reason for these problems is corruption of PST file, once the PST file is corrupted Outlook tends to behave abnormally and returns different errors. Here is the list of common error messages which indicates the Outlook PST file is damaged and needs to be repaired. The Outlook database file outlook.pst is not a personal folder file. 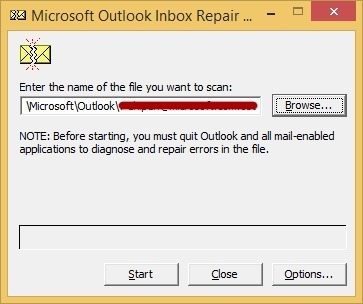 The error messages listed above points out that the Outlook PST file is severely damaged and you have to repair it ASAP so that you access your emails and other items again. Microsoft does provide some handy utilities like ‘Inbox Repair Tool’, ‘OST crop Tool’, to maintain integrity of Outlook pst file but these tools are not useful in conditions mentioned above. In such scenario you must take help from some third party pst repair tool, one such application is Stellar Phoenix Outlook PST Repair software. It is one of the widely used application used to repair damaged Outlook PST file, Stellar Phoenix Outlook PST repair utility is designed with advanced algorithms which guarantees high success rate in case of severe corruptions. The interactive GUI allows user to perform repairing pst files without any hassle. Once the software is started click on Select button to load the PST file, You can browse to the location of PST file but if you don’t know the location just select the whole drive to be searched. you will get list of all available PST file in that drive. Once the PST file is selected click the Start button, software will start repairing the corrupt PST file. In the end it shows all email items in a tree view structure which is similar to MS Outlook. You can now any email item to preview the content. From the tree view structure select the items you want to recover and click on button “Save Recovered Items”. you can choose the location where you want to save the file.